You know exactly what you are going to get with this film and rather than making it predictable it just means that it delivers on a promise. It is the true story of a family that gets separated when the tsunami hit Thailand on Boxing Day 2004. I felt ready to cry around fifteen minutes in and this didn’t let up for the entire running time of the film. There was some criticism of how this film concentrates on the plight of one well off European family while ignoring the thousands of others affected but I think this is the correct choice, certainly in terms of looking at the plight of a few rather than the many. Clearly they needed to avoid making this look like an epic disaster movie as that would have been hideously disrespectful. The moment when the wave comes is cinematically impressive but doesn’t overshadow the tragedy. The scale of something like this is unimaginable but the scenes of devastation do make it clear exactly what and who was wiped out without making it look like a Roland Emmerich film. Concentrating on one family portrays the human tragedy rather than the natural disaster, which is how it should be and you do get a clear sense that these are just a few people among thousands who are suffering in a similar fashion. The fact that they are a British family is presumably a commercial decision, particularly when you consider that this is a Spanish film by a Spanish director (Juan Antonio Bayona who made the excellent The Orphanage) about a family who were in reality Spanish. They obviously wanted to use internationally recognisable actors and presumably Antonio Banderas and Penelope Cruz were not available. Ewan McGregor and Naomi Watts who do take the parts are both excellent. Naomi Watts has to sustain incredible pain and anguish for most of the time she is on screen and she more than rises to the task. Ewan McGregor has the less showy role but does have one moment where he really shows his reaction to the immensity of the situation. It is one of the points where the tears that have been welling up behind your eyes are likely to break out but it isn’t the first time and it won’t be the last. In particular there is a scene just after the wave crashes in where the mother can see one of her sons in the rushing water but can’t get to him that is brilliantly played and totally heartbreaking. A couple of years ago I saw stand up comedian Dominic Holland live on stage and he was raising laughs from the fact that while he had been struggling for years to become a mainstream entertainer, his preteen son had just landed a role in a major movie with Obi Wan Kenobi. The Impossible is that film and the young actor in question, Tom Holland is superb. It is a debut as impressive as Jamie Bell’s in Billy Elliot (which incidentally is also a role Holland played on stage). As the eldest of the three sons he is fantastically believable and provides what is probably the central performance of the film. 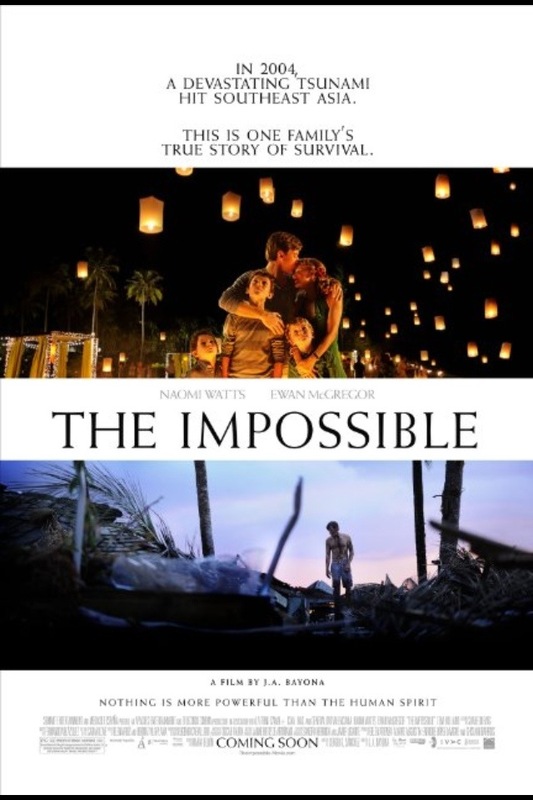 The Impossible clearly isn’t an easy watch but it is rewarding and you will shed tears of both horror and joy. I definitely recommend it. The Impossible is a 12A. It isn’t overly graphic although there are some nasty shots of open wounds and people who are dead or dying. There are some naked breasts but they are bleeding rather than sexualised. I would argue that this film could even be an easier watch for a younger audience as you need to be able to appreciate the nature and implications of what you are seeing for it to fully affect you. Under these circumstances even the scenes at the beginning of the family celebrating Christmas and the innocent shots of a calm and placid ocean are disturbing because you know what is coming. I would also suggest it is also a harder film to watch if you have a young family of your own. Tagged Ewan mcGregor, Naomi watts, The impossible, Tom hollandBookmark the permalink. Mark and I watched this today (while the boys were safely upstairs playing on their computers!) He likes disaster movies and I had told him I’d had a tsunami dream last night – woah. It had quite an effect. Mark was closer to tears than me I think, the Dad-playing-with-the-kids scenes were so warm and familar. The Mum was surrounded by worry/stress/portence so I didnt identify with her so much. But from the first minute I was chewing my nails knowing what was coming! I said it was a bit like the beginning of Jaws, and Mark agreed with the family playing happily in the sunshine and the water it was very similar, the camera out in the water offshore… But an excellent film, we have hugged our boys a bit tighter this evening and will donate more the next time a disaster appeal is made. It is a great film, totally compelling. It is a shame that Naomi Watts ended the year being remembered for Diana which was widely derided. She is brilliant in this.